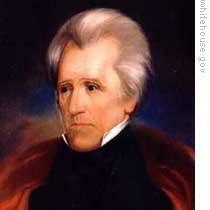 Andrew Jackson became president of the United States in March of eighteen twenty-nine. Thousands of his supporters came to Washington to see him sworn-in. Many were there, however, only to get a government job. They expected President Jackson to dismiss all the government workers who did not support him in the election. Jackson supporters wanted those jobs for themselves. This week in our series, Frank Oliver and Maurice Joyce continue the story of Andrew Jackson and his presidency. Most of the jobs were in the Post Office Department, headed by Postmaster General John McLean. McLean told Jackson that if he had to remove postmasters who took part in the election, he would remove those who worked for Jackson as well as those who worked for the re-election of President John Quincy Adams. Jackson removed McLean as postmaster general. William Barry of Kentucky was named to the position. Barry was willing to give jobs to Jackson's supporters. But he, too, refused to take jobs from people who had done nothing wrong. Many government workers had held their jobs for a long time. Some of them did very little work. Some were just too old. A few were drunk most of the time. And some were even found to have stolen money from the government. These were the people President Jackson wanted to remove. And he learned it was difficult for him to take a job away from someone who really needed it. One old man came to Jackson from Albany, New York. He told Jackson he was postmaster in that city. He said the politicians wanted to take his job. The old man said he had no other way to make a living. When the president did not answer, the old man began to take off his coat. "I am going to show you my wounds," he said. "I got them fighting the British with General George Washington during the war for independence." The next day, a New York congressman took President Jackson a list of names of government workers who were to be removed. The name of the old man from Albany was on the list. He had not voted for Jackson. "By the eternal!" shouted Jackson. "I will not remove that old man. Do you know he carries a pound of British lead in his body?" The job of another old soldier was threatened. The man had a large family and no other job. He had lost a leg on the battlefield during the war for independence. He had not voted for Jackson, either. But that did not seem to matter to the president. "If he lost a leg fighting for his country," Jackson said, "that is vote enough for me. He will keep his job." Jackson's supporters who failed to get the jobs they expected had to return home. Next, the president had to deal with a split that developed between himself and Vice President John C. Calhoun. The trouble grew out of a problem in the cabinet. Three of the cabinet members were supporters and friends of Calhoun. These were Treasury Secretary Samuel Ingham, Attorney General John Berrien, and Navy Secretary John Branch. A fourth member of the cabinet, Secretary of State Martin van Buren, opposed Calhoun. The fifth member of the cabinet was Jackson's close friend, John Eaton. Eaton had been married a few months before Jackson became president. Stories said he and the young woman had lived together before they were married. Vice President Calhoun tried to use the issue to force Eaton from the cabinet. He started a personal campaign against Missus Eaton. Calhoun's wife, and the wives of his three men in the cabinet, refused to have anything to do with her. This made President Jackson angry, because he liked the young woman. The split between Jackson and Calhoun deepened over another issue. Jackson learned that Calhoun -- as a member of former president James Monroe's cabinet -- had called for Jackson's arrest. Calhoun wanted to punish Jackson for his military campaign into Spanish Florida in eighteen eighteen. Another thing that pushed the two men apart was Calhoun's belief that the rights of the states were stronger than the rights of the federal government. His feelings became well known during a debate on a congressional bill. In eighteen twenty-eight, Congress had passed a bill that -- among other things -- put taxes on imports. The purpose of the tax was to protect American industries. The South opposed the bill mainly because it had almost no industry. It was an agricultural area. Import taxes would only raise the price of products the South imported. The South claimed that the import tax was not constitutional. It said the constitution did not give the federal government the right to make a protective tax. The state of South Carolina -- Calhoun's state -- refused to pay the import tax. Calhoun wrote a long statement defending South Carolina's action. In the statement, he developed what was called the Doctrine of Nullification. This idea declared that the power of the federal government was not supreme. 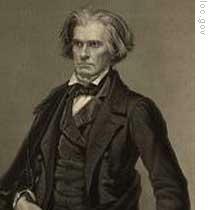 Calhoun noted that the federal government was formed by an agreement among the independent states. That agreement, he said, was the Constitution. In it, he said, the powers of the states and the powers of the federal government were divided. But, he said, supreme power -- sovereignty -- was not divided. Calhoun argued that supreme power belonged to the states. He said they did not surrender this power when they ratified the Constitution. In any dispute between the states and the federal government, he said, the states should decide what is right. If the federal government passed a law that was not constitutional, then that law was null and void. It had no meaning or power. Then Calhoun brought up the question of the method to decide if a law was constitutional. He said the power to make such a decision was held by the states. He said the Supreme Court did not have the power, because it was part of the federal government. The other states of the union, Calhoun said, would then be asked to decide the question of the law's constitutionality. If two-thirds of the states approved the law, the complaining state would have to accept it, or leave the union. If less than two-thirds of the states approved it, then the law would be rejected. None of the states would have to obey it. It would be nullified -- cancelled. The idea of nullification was debated in the Senate by Daniel Webster of Massachusetts and Robert Hayne of South Carolina. Hayne spoke first. He stated that there was no greater evil than giving more power to the federal government. The major point of his speech could be put into a few words: liberty first, union afterwards. Webster spoke next. He declared that the Constitution was not the creature of the state governments. It was more than an agreement among states. It was the law of the land. Supreme power was divided, Webster said, between the states and the union. The federal government had received from the people the same right to govern as the states. 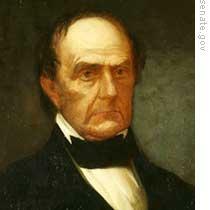 Webster declared that the states had no right to reject an act of the federal government and no legal right to leave the union. If a dispute should develop between a state and the federal government, he said, the dispute should be settled by the Supreme Court of the United States. Webster said Hayne had spoken foolishly when he used the words: liberty first, union afterwards. They could not be separated, Webster said. It was liberty and union, now and forever, one and inseparable. No one really knew how President Jackson felt about the question of nullification. He had said nothing during the debate. Did he support Calhoun's idea. Or did he agree with Webster. That will be our story next week. Our program was written by Frank Beardsley. The narrators were Frank Oliver and Maurice Joyce. Transcripts, MP3s and podcasts of our programs are online, along with historical images, at www.unsv.com. Join us again next week for THE MAKING OF A NATION - an American history series in VOA Special English. constitution 宪法, constitutional 宪法的, constitutionaliy 合宪性， 符合宪法。。。obviously, words are interrelated, so are the things in the world.